Are any of you fabulous teachers working on geometry? If so, these two freebies might be helpful to you. First, is a slideshow I use to introduce polygons. 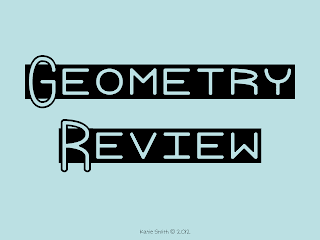 The second is a geometry unit review that includes lines, angles, polygons, 3-D shapes, area, and perimeter. The second freebie comes in two formats -- as a PDF so you don't have to mess with fonts or as a PowerPoint so you can edit until your heart's content. Click on the pictures above to hop on over to my blog and download these freebies. I help straight-talking elementary teachers, with a flair for fun, challenge every learner with engaging multi-leveled projects, challenges, and menus that can be used to personalize learning in grades 2-3.